Two young elephant enjoy a passionate day together. 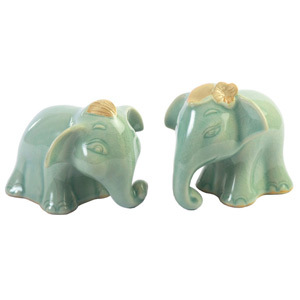 Thai ceramists handcraft these cartoonish ceramic figurines with celadon techniques. 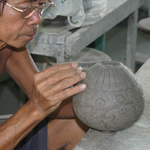 To craft these two statuettes, the master artisans firstly cast a clay mix inside moulds. Once solid enough, the pieces are removed from the moulds and engraved, carved and detailed by hand. When fully dried, they are then fired in the kiln at a temperature of about 800 degrees Celsius. Next, the pieces are dipped in a glaze mix and left to dry. Once fully dried, they are fired again in the kiln at a temperature of about 1,300 degrees Celsius. 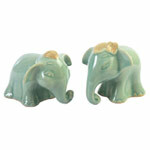 The surface of these celadon elephant statuettes is glossy, light blue and highly crackled.